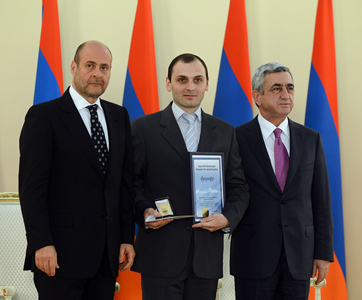 NEW YORK, New York — Armenia Fund USA proudly congratulates its very own board member Arthur Grigorian, MD as a 2012 recipient of Armenia’s Presidential Award. This honor is bestowed to a select few candidates each year in fields ranging from the arts and Armenian studies to physics, computer/information sciences, literature and medicine. Each candidate is nominated and selected by expert panels in respective fields, making this both a prestigious national honor as well as salute among peers. Dr. Grigorian is more than a neurosurgeon. He is at the at the forefront of management of complex intracranial and spine pathology, with over 22 years of experience and a thriving surgical practice in Macon, GA. He is also a visionary in service to his native country of Armenia. Thanks to Dr. Arthur Grigorian’s hands-on leadership, the Armenian Physicians Training Program has become a crown jewel in the Armenia Fund USA portfolio of health care delivery projects. 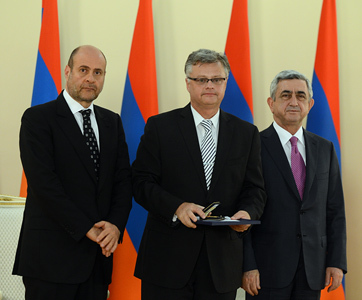 2002: An official cooperation agreement was signed between the National Institute of Health of Armenia and MUSM, MCCG and the Georgia Neurological Institute (GNI). 2004: Armenian neurology specialists trained by a technical support team from the U.S., when the first sleep laboratory in the region, donated by local physicians, was established in Yerevan. The MCCG also transported valuable surgical equipment and a surgical instrumentarium to Yerevan. 2004: Special fellowships created for outstanding candidates to participate in Observational Fellowships at MCCG and GNI. 2005: Additional cooperation agreements forged between YSMU and the above-mentioned entities. 2009: Through a collaboration between Dr. Grigorian and Dr. Gohar Kalyan, former dean of YSMU, a new vascular stroke center opened in Yerevan within the structures of YSMU. Ongoing: Approximately 35 medical students, residents and physicians have already received training in the U.S. for various specialties, including pediatrics, OB-GYN, general and plastic surgery, neurology and radiology. In 2013, another 4 candidates were selected to receive training. Additionally, more than 100 patients have undergone emergency or elective treatment through the stroke center. As the mastermind of the Neurosciences Physicians’ Training initiative, a program supported by Armenia Fund USA, Dr. Grigorian is enabling talented young neurosurgeons in Armenia to receive best practices training and western medicine experience in a critical specialty. In 2001, Dr. Grigorian, noted the high rate of stroke victims in Armenia, second only to cardiovascular disease. As an Associate Professor of Surgery at Mercer University School of Medicine (MUSM) in Georgia, USA, Dr. Grigorian initiated the program in cooperation with the National Institute of Health of the Republic of Armenia and later with Yerevan State Medical University. 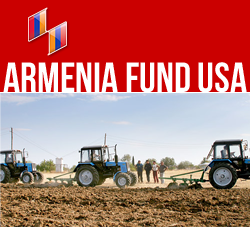 The purpose was to establish a channel of cooperation that would facilitate the exchange of students and/or faculty members between Armenia and the U.S. Such exposure would help provide talented neuroscience specialists with the skills and experience to serve the needs of Armenia’s patient populations. 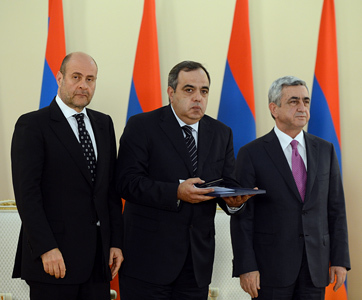 The Presidential Awards 2012 ceremony was held in Yerevan on May 29, 2013. The coveted prize was presented to Dr. Grigorian and other recipients by Armenia’s president, along with Albert Boghossian, founder of the Boghossian Foundation—a family foundation that helps makes this distinguished award possible. To that end, Dr. Grigorian has set the bar ever higher to make Armenia a center of medical excellence in neurosciences and other specialties. Recently, Dr. Grigorian recounted a story that attests to the significant strides already made in stroke management. Born and raised in Armenia, Dr. Arthur Grigorian received his early medical training at leading institutes in Moscow. After coming to the United States, he completed a fellowship in cerebrovascular surgery at Albert Einstein College of Medicine/Beth Israel Hospital in New York, followed by another fellowship in endovascular neurosurgery. He completed his residency in neurological surgery at the UMDNJ-New Jersey Medical School. He is board certified by the American and European Boards of Neurological Surgery. Currently, through his practice at the Georgia Neurological Institute, Dr. Grigorian is the only neurosurgeon managing complex vascular/endovascular lesions in the middle-Georgia area. Dr. Grigorian focuses on the management of complex vascular lesions of the brain and spinal cord including aneurysms, arteriovenous malformations and hemorrhagic/ischemic strokes. His areas of interest also include vascular/endovascular and general neurosurgery together with management of complex spine disorders and intracranial neoplasms. He is a member of numerous medical organizations, including the American Association of Neurosurgeons, CNS, European NS Associations, American Stroke Association and the MCCG stroke team. He has authored more than 40 articles related to intracranial pathology and two monographs on subarachnoidal hemorrhages and ischemic strokes, including in Armenian and Russian. He is an honorary member of multiple international neurosurgical societies.